Mount Russell (11,670 feet) has captured the imagination of climbers for years. From certain aspects it has been likened to K2 in appearance, although it sits nearly 17,000 feet lower. Mount Russell receives the brunt of the weather systems approaching the Alaska Range. That, coupled with its extreme remoteness, makes an attempt on this attractive peak a challenging endevor. The North Ridge of Mount Russell is splendid outing up a beautiful glaciated ridge. It is made easier by an airplane landing area just northeast of the peak. 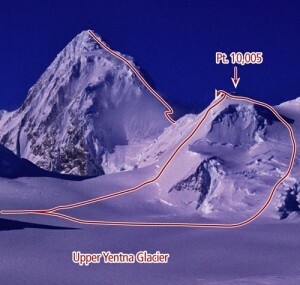 With only six recorded ascents, it is likely you will have this peak to yourself. Which SuperTopo guidebooks include a topo for North Ridge?